Виртуозная работа , в комплекте всё не обходимое Полный комплект. 2 семинара по левитации предметов от Bruno Copin. Здесь можно обучиться левитации предметов, а так же фокусам с использованием невидимой нити. Your first Instant Thread Security (I.T.S.) 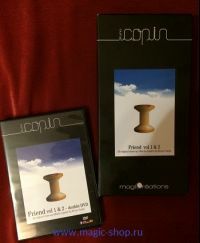 has been provided Free with the DVD Friend Vol. 1. A special mini close-up mat has also been included. When the mat is combined with the I.T.S. it provided a formidable "hook-up" system which is extremely quick and secure. Butterfly Effect - Romantic poetry in motion.....in the spectator's hand. Rolling Cigarette - An old classic transformed by a very funny explanation. Magic Pitcher - The spectator becomes the magician. Great Escape - A subtle steal. This effect could have been called Houdini. Rising Card - A repeatable rising card effect......yet again in the spectator's hand. Lie Detector - Raise your right hand and say "I swear." Icare's Dream - Idyllic levitation of a card (demonstration only). Material and explanation available separately. Surprised in the Pockets - An original version of the classic cards to pocket effect. In FRIEND, Vol. 2 you will find a pretty glove, ideal for performing the surreal effect Invisible Man. Included is a special pair of glasses that will help you considerably when preparing the thread. As a bonus, the History of the thread featuring magicians Daniel Rhod and David Stone (in French) will develop your historical knowledge of this subject. (A written English translation has been included). Invisible Man - A surrealist effect with a glove. Any Volunteers? - Step forward! Saint Exupery - Can you hear the planes? Ripples - A visual double miracle on the table. Surf - A superb flourish worthy of attention. Lover in the Cupboard - A substitution trunk style effect with cards. The story gives meaning to this effect. Flourishes - A mix of balanced flipping flourishes using invisible thread. It Was You! - A signed postcard appears in a sealed envelope (demonstration only). Material and explanation available separately. Not New. Previously Viewed. In Good Shape.